PLEASE NOTE: This is the old version of the game client! Search the store for the DARK PROPHECIES expansion to continue with all your cards in the new app! 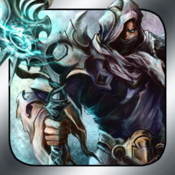 Shadow Era is a full-scale, Magic style, free to play collectible trading card game featuring gorgeous card art and deep strategy, while still being easy to learn and have quick battles on the go. We now have almost 2 million players! Thanks for all your support!! Start your campaign by choosing your Human Hero, and get a free starter deck. Battle with AI opponents or other players to earn more cards, try out new classes, and even play as one of the evil Shadow Heroes. Your progress and cards will be saved on the server and can be accessed from any device or play on the web right in your browser! Please visit http://www.shadowera.com for the game rules, full card list, tutorials, and active forums.